The Travels of the Agnew Family » Hot, hot, hot!!! It's amazingly hot .... over 35C or 95F and the air is very heavy. Definitely not a good day to do a lot of walking. Which is OK as we're all still happy to be visiting, especially Caity. This afternoon we did venture out for a short drive --- girls in one car, boys in another. 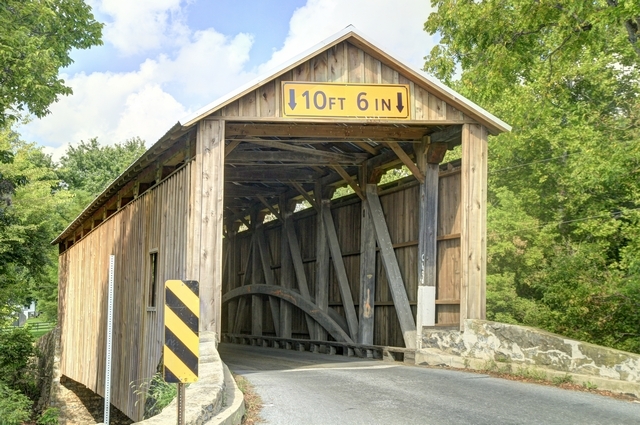 Not far from Jim and Esther's home is a covered bridge. It was built in 1846 over the Conestoga Creek. Esther said a new roof was put on last year. Jim and Esther live on Country View Drive. It's easy to figure out how the road got it's name. The women didn't have a camera with them so instead of spending time taking photographs we did a little touring in the area. We saw a couple of one room school houses, tobacco leaves drying in a barn (that one surprised me) and drove down Crooked Lane. Now, Crooked Lane wasn't that crooked but it was a narrow road which had the feel of someone's laneway especially when we drove between a house and a barn.